A new dynamic, dual-LED display solution powered by Renewed Vision software is now driving all scores, player statistics, live video, and instant replays for women’s sports at Memorial Coliseum, home of the Kentucky Wildcats NCAA women’s basketball team. 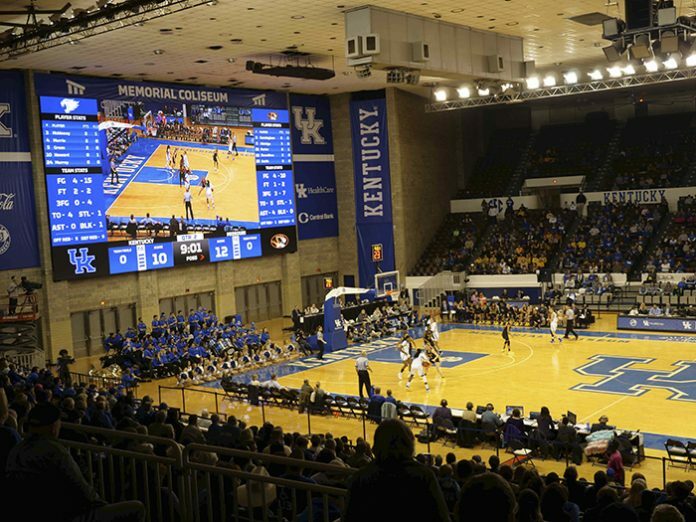 Formetco Sports, the systems integration division of LED display maker Formetco, Inc, managed the custom design and integration of the end-to-end systems inside the gymnasium on the campus of University of Kentucky in Lexington. Formetco Sports installed Renewed Vision’s ProPresenter Scoreboard and PVP3 multi-screen media server software to drive game-day displays on two new Formetco displays: A 60 x 30-ft Formetco LED video scoreboard, and a 3.5 x 100-ft ribbon board. The integrated Renewed Vision workflow interoperates with existing control hardware and software, including Stat Crew, a scoring and statistics application from CBS. The Renewed Vision workflow also utilises NDI IP video networking to deliver multiple video and data signals from a single network interface, and eliminate multiple SDI components and cabling from the infrastructure. The main LED video scoreboard—a massive video wall filling one side of the gym—primarily receives live video feeds and instant replays from a production switcher and instant replay systems in the existing control room. PVP3 arranges each display into zones earmarked for certain content, such as advertising, game stats, and crowd prompts like “Great Play,” “Match Point,” or “Ace.” With strict rules prohibiting the display of moving video during game play, the PVP3 user interface adds value by allowing operators to switch from moving to still imagery with a single click.